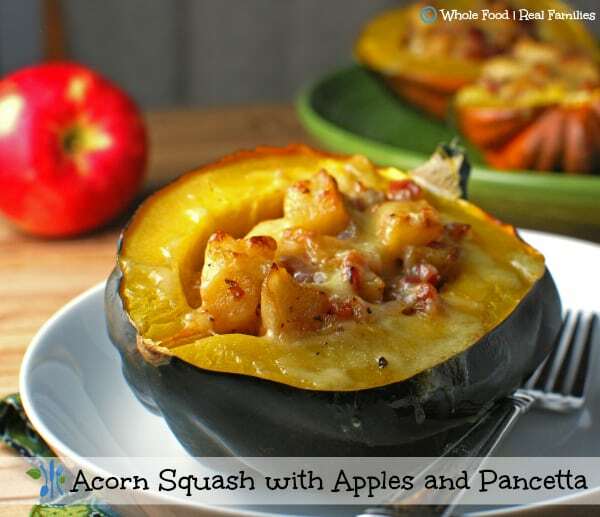 Acorn Squash Apples and Pancetta is a perfect blend of fall flavors – both savory and sweet. Acorn squash is such a seasonal beauty. No better way to eat it than to stuff it with another seasonal beauty – Apples! 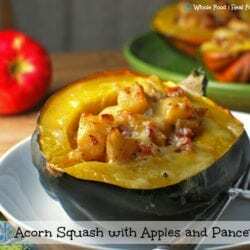 Delicious and easy, sweet and creamy, this recipe will put acorn squash on your winter rotation! It took me until my adult years to really appreciate winter squash. As a kid, I just thought they were the equivalent of gourds you used for decoration at Halloween. But I have found that the older I get, the more I appreciate the veggies that come into season in the fall. Somehow they seem more savory than the sping and summer harvest. Maybe that is because the weather has cooled and we look to warm food to warm us up from the inside. Need more winter squash recipes? 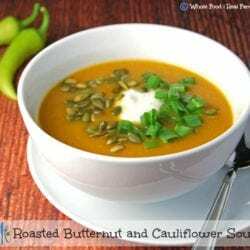 Try Roasted Butternut and Cauliflower Soup! 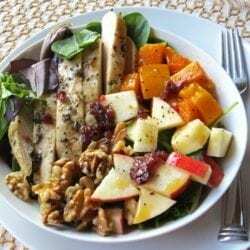 And if you are looking to cook once and eat twice this week, check out the Welcome Fall Harvest Salad, which takes advantage of early week leftovers for a late week salad suitable as a main dish. Preheat oven to 400 degrees. Split squash in half and remove seeds with a sturdy spoon. Place squash cut side down in a casserole dish. Fill halfway with water and cover tightly with foil. Place squash in the oven and cook for 45-50 minutes, or until the squash is fork tender. While squash is cooking, met butter in a large saute pan. Add pancetta and cook until browned. Add diced apples, walnuts, and maple syrup and cook until apples release their juices then reduce. When squash is finished cooking, remove from casserole dish and turn cut side up in a baking dish or on a sheet pan. Fill the hollows of the squash with the apple mixture. Top with cheddar cheese and place back under the broiler until the cheese is melted and bubbly, about 5 minutes. Enjoy! By the way, be bold and try eating the skin! You will be pleased to find out the water bath softens the skin so that you can eat it with no problems! This looks wonderful! It would be a great addition to any Thanksgiving table!! Thanks for sharing it with us at Foodie Fridays! I will be sharing it on my Facebook page tomorrow! Have a wonderful weekend! Thanks Michelle! Thank you for sharing! I love #FoodieFridays! You guys do such a great job of sharing the best recipes with everyone!